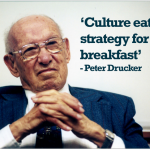 Peter Drucker is reputed to have said that “culture eats strategy for breakfast”. There is some debate around whether he actually said this but whether he did or not it is true. Leaders need to invest in setting the direction of the company and creating achievable strategies, plans and objectives but if the behaviour and attitudes of the people are not in line with this the company will struggle to achieve its objectives. This is most often apparent when a leader or governing board embarks on a change management programme or a new leader is appointed. The strategy and policies may be accepted but your people don’t seem to buy into it and you sometimes wonder if some of them are actually working against you. So what do we mean by culture? It’s the shared beliefs and values that define your organisation and is visible through the behaviours of your people. Culture can be difficult and slow to change but as the key enabling factor in achieving strategy and plans all investment in creating and maintaining a congruent culture will heap rewards. Leaders that get it right and spend time aligning strategy with culture tell us that their work becomes more enjoyable and that they can spend less time managing and more time leading. So how can a leader ensure that the culture supports the strategy and that they have congruence throughout the company? Igniting Minds works in partnership with leaders to create and maintain a congruent culture that results in almost effortless achievement of organisational goals. We will design and deliver a support programme that meets your needs and budget. We will work with you and your people to ensure that their values, beliefs and behaviours are in line with the organisation’s. You can then get on with the job of being the Chief Excitement Officer in your company. Call us on 020 8740 8802 to discuss how we can help you create congruence throughout your organisation.